General Erdle was a career Air Force officer, entrepreneur, and philanthropist. A native of Bethlehem, PA, he earned a Bachelor of Science degree from the U.S. Military Academy and entered the fledgling U.S. Air Force. 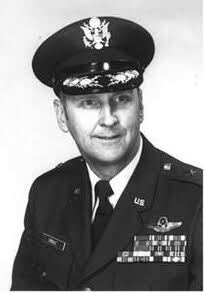 General Erdle was a command pilot, flying dozens of aircraft throughout his Air Force career, most notably the F-84, F-100, and T-33. He earned a master’s degree from the University of Michigan and his doctorate from the University of Colorado. Having miraculously survived a horrific crash in an F-84, his Air Force career put him on a path to a new passion and began a lifetime of support to the newly formed U.S. Air Force Academy. General Erdle was among the first academic cadre instructors when the U.S. Air Force Academy opened its doors at its permanent location in Colorado Springs. He spent the remainder of his military career at the Academy, which notably included a return to flying status. General Erdle’s career at the Academy was truly remarkable and diverse in his impact on the Air Force’s future leaders – mechanics instructor, baseball coach, NCAA representative, and Vice Dean of Faculty. He was the youngest colonel in the Air Force when he was appointed the Academy’s 13th Permanent Professor. He served as the Permanent Professor of Engineering Sciences (1964-1965) and subsequently as the Permanent Professor for the newly designated Department of Engineering Mechanics (1965-1973). He also served as the 6th Vice Dean of the Faculty (1973-1979) and held the title of Permanent Professor Emeritus. Following his retirement from the Air Force in 1979, General Erdle worked for the Bechtel Corporation, establishing an educational system in Jubail, Saudi Arabia for the Bechtel operation. While with Bechtel, he managed numerous education and construction contracts that helped transform the educational system of Saudi Arabia. Upon returning to Colorado, he founded the International Education Foundation, mentoring small, minority owned businesses in a first-of-its-kind business incubator in Colorado Springs. In 1984, General Erdle co-founded the Academy Research and Development Institute (ARDI), establishing and managing endowed professorial chairs for the Air Force Academy. He later served as ARDI President and CEO. General Erdle and ARDI have been major supporters of the Dean of Faculty and the Air Force Academy mission for more than a quarter of a century. In recognition of his contributions, General Erdle was named an honorary member of the USAFA Association of Graduates and was also a recipient of the Superintendent’s Award for Distinguished Service to the United States Air Force and the Air Force Academy. In 2002, the Philip J. Erdle Chair in Engineering Science was designated in his honor. He was a visionary leader for the Air Force Academy academic program. General Erdle passed away in May, 2013, at the age of 82. He was devoted to his wife of 61 years, Carolyn, and his five children and 15 grandchildren. He was always quick with a joke and generous to a fault, always eager to help those less fortunate than he. He is missed dearly by his family and friends, and by the thousands of Air Force Academy cadets and officers whose lives he touched. Major General William Lyon, without question, has led an achievement-filled life. Even more impressive is the fact that General Lyon’s many accomplishments are wide ranging, as he made his mark as a successful businessman, a decorated member of the military and an active supporter of the community. Primarily known for his philanthropy, support of the arts, new home construction business, and extensive historical automobile collections, Major General William Lyon was also the third Chief of Air Force Reserve, once owned half of airline AirCal, and served as Chairman of the Board of the Orange County Performing Arts Center. 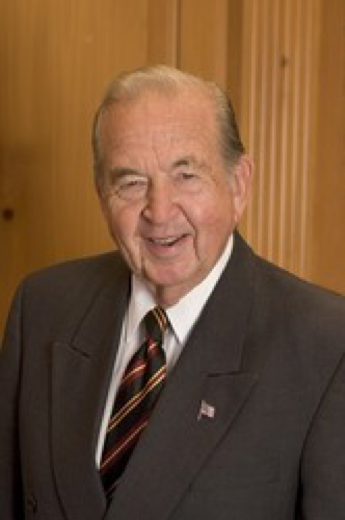 William Lyon has always been an active supporter of community organizations, serving on numerous boards. He is a huge support of the Air Force Academy having served as the United States Air Force Academy Research and Development Institution (ARDI) Chairman of the Board, Chairman (and later Chairman Emeritus) and Director of the USAF Falcon Foundation, as well as a member of the Air Force Academy Foundation. General Lyon enlisted in the U.S. Army Air Corps as a reservist in 1943 and continued serving as a civilian flight instructor until he received a direct appointment as a flight officer in June 1944. During World War II, he was assigned to the 6th Ferrying Group and ferried aircraft to the Pacific and European theaters. In 1945 he was assigned to the North African Division of the Air Transport Command, returning to the United States in 1946. In 1947 he was commissioned as a second lieutenant and participated in various Reserve assignments until his voluntary recall to active duty in 1951. He was then assigned to Headquarters Air Training Command as a staff pilot and was later transferred to the Military Air Transport Service, flying air evacuation and ferrying missions. In 1953 he volunteered for a tour of duty in Korea and flew 75 combat missions in the C-46 and C-47. From 1954 to 1963, General Lyon was assigned to various positions in the Reserve and served as a flight commander and operations officer. In 1963 he was named commander of the 929th Tactical Airlift Squadron, March Air Force Base, Calif., and subsequently served as commander of the parent unit, the 943d Tactical Airlift Group. General Lyon was assigned as mobilization assistant to the commander, Sacramento Air Materiel Area, McClellan Air Force Base, Calif., in June 1970, and in February 1972, he became mobilization assistant to the commander, Fifteenth Air Force at March Air Force Base. In March 1974 he was appointed mobilization assistant to the commander in chief, Strategic Air Command, Offutt Air Force Base, Neb., where he was involved in the planning of the transfer of designated KC-135 units to the Reserve Forces. In April 1975 General Lyon was ordered to active duty to serve as chief of Air Force Reserve, Headquarters U.S. Air Force, Washington, D.C. In addition to his remarkable military service, he is a successful businessman. More than 50 years ago, William Lyon started building homes for returning military personnel and others attracted to the Golden State. This modest effort evolved to become William Lyon Homes, Inc., which is now one of the nation’s largest home builders. Headquartered in Newport Beach, William Lyon Homes has constructed more than 75000 new residences in Arizona, California, Nevada and Colorado. General Lyon’s business success isn’t limited to home building. During the 80s, General Lyon established a multifamily real estate company to further diversify his real estate holdings. Today, three privately-held companies, Lyon Capital Ventures, Lyon Realty Advisors and Lyon Management Group, acquire, develop and manage over 10,000 apartment units. In 1981 he and a partner purchased AirCal, a regional air carrier based in Newport Beach, California. General Lyon served as their Chairman & CEO until 1987 when he merged AirCal with American Airlines. His love of flying then led him to purchase Martin Aviation, a fixed based operator, at John Wayne Airport in Orange County, California, as well to establish Lyon Air Museum. Most recently, General Lyon, along with other investors, opened Commercial Bank of California, which he chairs. William Lyon generously shares his business expertise by serving on the boards of several companies. He is a retired director of American Airlines. Given his long history of achievement, William Lyon has deservedly received numerous honors, including: the United States Air Force Academy Distinguished Service Award (November 2005); Ernst & Young’s National Entrepreneur of the Year Award (Real Estate category, November 2005); Operation Smile’s Corporate Humanitarian Award (October 2005); USC Marshall School of Business Leadership Award (September 2005); Distinguished Public Service Award presented by the Chairman of the Joint Chiefs of Staff (May 2005); Chapman University’s Presidential Medal in Business and Entrepreneurship Award (2004); and, Honorary Doctorate of Humane Letters from the University of Southern California (May 2002). William Simon was a successful banker, public servant, and noted philanthropist. He was a bond trader, a pioneer of leveraged buyouts, and merchant banker; he served as Secretary of the Treasury in the Nixon and Ford administrations and led the U.S. Olympic Committee during the 1984 summer games. He gave generously of his own wealth and became a trustee of some of America’s most influential philanthropic organizations. After service in the U.S. Army, Mr Simon graduated from Lafayette College in 1952 and joined Union Securities the same year. He served as Vice President of Weeden & Company before becoming senior partner in charge of the Government and Municipal Bond departments at Salomon Brothers, where he served on the firm’s seven-member executive committee. Appointed Deputy Secretary of the Treasury in 1973, Mr. Simon later that year also became the first Administrator of the Federal Energy Office. In 1974, President Nixon appointed him 63rd Secretary of the Treasury, a post to which he was re-appointed by President Ford and which he held until 1977. Following government service, Mr. Simon co-founded Wesray Corporation, a successful pioneer in mergers and acquisitions. Seven years later he launched WSGP International, which concentrated on investments in real estate and financial service organizations. In 1988, he established William E. Simon & Sons, a global merchant bank. During his remarkable career, Mr. Simon served on the boards of over 30 companies including Xerox, Citibank, Halliburton and United Technologies. In recognition of his visionary leadership in business, finance and public service, the Graduate School of Management at the University of Rochester was renamed the William E. Simon Graduate School of Business Administration in 1986. Mr. Simon was an active member of the United States Olympic Committee for over 30 years. He served as Treasurer and later as President of the U.S. Olympic Committee for the four-year period which included the 1984 Games in Los Angeles. From 1985-1997, he served as the first Chairman of the U.S. Olympic Foundation, created with the profits of the Los Angeles games. At the United States Air Force Academy, he was a board member of The Academy Research & Development Institute (ARDI), and chairman of its Investment Committee. He established the William E. Simon Chair for Advancement of the American Founding Principles. Simon died in 2000, and his foundation, is in the process of spending itself down, with plans to complete the process within the lifetime of the Simon’s children. It was, he thought, an easy choice. He believed that the capitalist system in which he thrived—which had produced, in his words, “the greatest prosperity, the highest standards of living, and most important, the greatest individual freedom ever known to man”—would soon enough bring forward new wealth, new philanthropists, and new ideas. Mr. Simon was married to Carol Girard Simon, who died in 1995, for 45 years and, until his death, his second wife, Tonia Donnelley Simon. He had seven children and 25 grandchildren.